I got new glasses, and not a moment too soon. My previous ones were stretched out incredibly from when my face was bigger; that, plus too-big lenses, made them super unflattering. 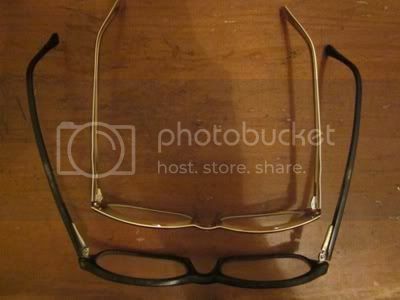 Here are my new glasses inside my old ones - see what I mean? What progress have you made on your goals this week? Take time to figure out what makes up your DNA. When it comes down to it, what do you stand for? And then, when you know who you are, turn up the volume! I made a list of fifty nouns/adjectives I would use to describe myself and my relationships with the people/places/things I love and consider very important in my life. 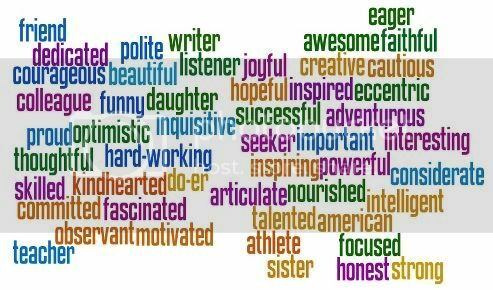 Then I used them to make a Wordle in order to remind myself of how wonderfully multi-faceted I am and to help me keep in mind the people, things, and ideas that make me who I am. 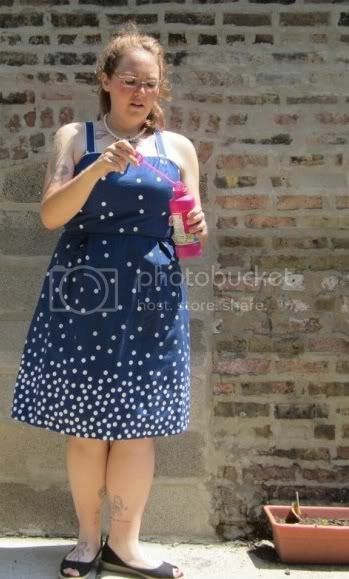 I dressed up and had a little photo shoot out in my yard to celebrate the one year anniversary of my biggest "before" pictures. I wore a dress that Jill gave me, one I coveted incredibly when she bought it (not only because it was cute, but because I was so jealous of her walking into a store and being able to wear whatever cute thing she wanted). And I felt so incredibly lovely. Did you have a moment in your life where everything changed for you, an epiphany moment, or has it happened gradually? As far as weight loss, I had an epiphany, for sure - it was this time last summer, when I felt so ashamed of what I had allowed to happen to my body that I avoided my friends and family. Not only that, I felt physically limited - it was hard to shower and put my shoes/socks on and get out of bed in the morning. I wasn't sleeping well, and I had backaches all the time. I knew that if I didn't do something, I was going to die. So I took a walk around my neighborhood, and then another the next day. I ate better and I ate less. I stopped drinking anything that wasn't water or unsweetened tea, and I starting doing all my own cooking (the anniversary of my last takeout delivery was June 18 - looking at what I ordered, I feel sick and can't imagine eating even a quarter of it now, even on my worst days). And then I started to blog. It all just sort of fell into place - not to say it hasn't been challenging, but everything in my life came together and it was the right time for me to seize the opportunity. If I hadn't done it then, I don't know when would have been a better time. What made you get involved with the Beat The Heat challenge? Amy! I have loved doing all her challenges - especially because I get to pick my own goals. I love having a to-do list of things I want to accomplish. I don't watch TV - I have a TV but no cable/satellite/etc. I mostly watch movies, either DVDs or stream Netflix through the Wii. When I watch TV shows, it's usually on DVD so I can watch a lot of it at once. I'm an exceptionally patient person, but I just don't like cliffhangers! You just had me take off my own glasses and look at them! Hehe... Not stretched too bad, but some all the same! Great work on that equally great goal! You are too cute! I love the way you look in a dress. :) Keep up the hard work! Woah the new glasses are so cute and I love that they really suit your face. LOVE the new glasses and the photo shoot! Would love to see more pictures of the photo shoot! You are doing so awesome! Keep it up woman! Wow, that glasses photo is amazing. What an incredible visual representation of how much you have changed. You look so adorable in that dress! That glasses picture is a stunner. You never think about those sorts of things. But holy mack. I am with you on the cliffhangers. Give me a pile of DVD's and I will marathon it. Lovely picture Mary. Love the wordle idea! I absolutely CANNOT WAIT to do that with my glasses!!! Great pic Mary and I love blowing bubbles too!! :) If you have time you should check out Dexter on netflix. Its certainly NOT for the faint at heart, but a GREAT show! You look so pretty, Mary! Great pics! And I love that Wordle! Oh my - that glasses photo really does speak 1000 words! And congrats as well on breaking into the 100's - what an accomplishment in a year!! You are a constant source of motivation. Thank you. I just adore that dress! Soo sooo cute!! Also that picture of your old and new glasses is A-Freaking-Mazing! Wow what a victory picture!